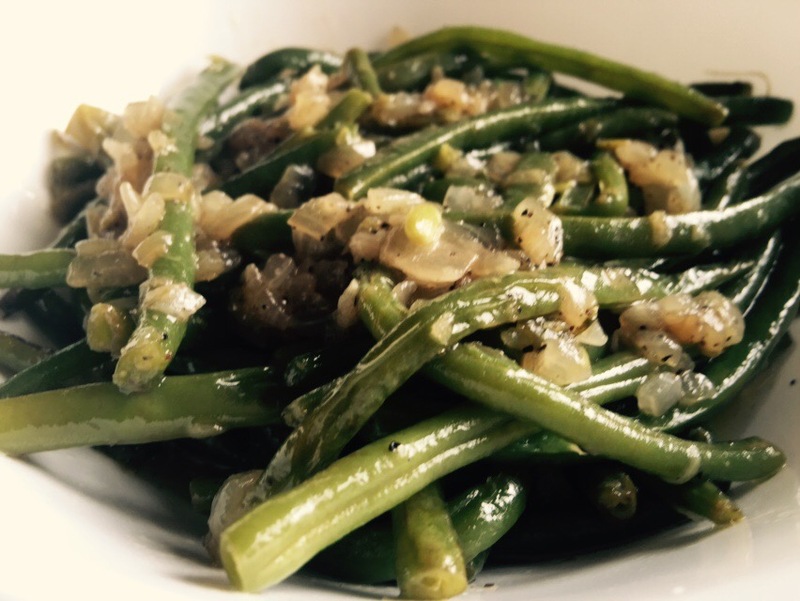 These perfectly tender green beans are sure to delight your taste buds, with comforting sautéed onions and lemony tang, balanced with soothing olive oil. 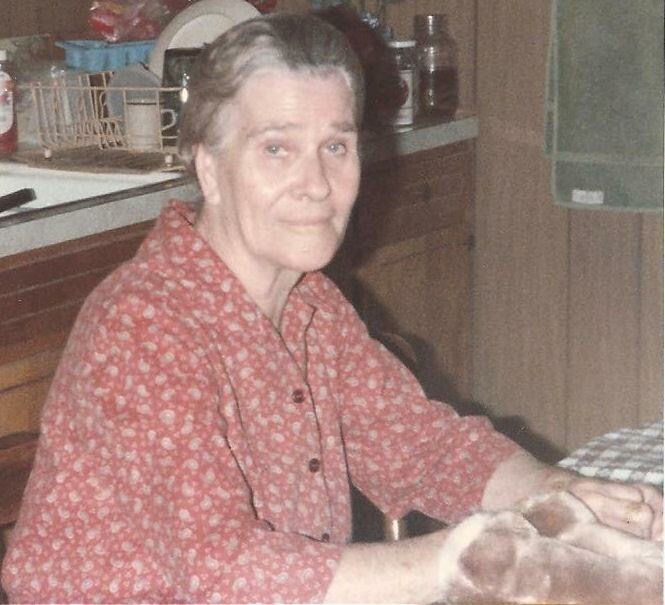 One of my fondest memories as a young child living in the tiny town of Sedgwick, Arkansas (population 152, as of the last census) was spending time with my Grandma Lawson. I lived right down a small gravel road from Grandma’s house and I would walk down that road nearly every morning to visit her. As a financially poor (but spiritually rich) devout woman of United Pentecostal faith, Grandma did not have technology to entertain me. TV was only for news and music was limited to country gospel. My toy of choice was paper dolls I created by cutting out clothing models from the Sears Roebuck catalog and pasting them to cardboard using glue Grandma made me from flour and water. My best memories of Grandma was of her cooking in her country kitchen. 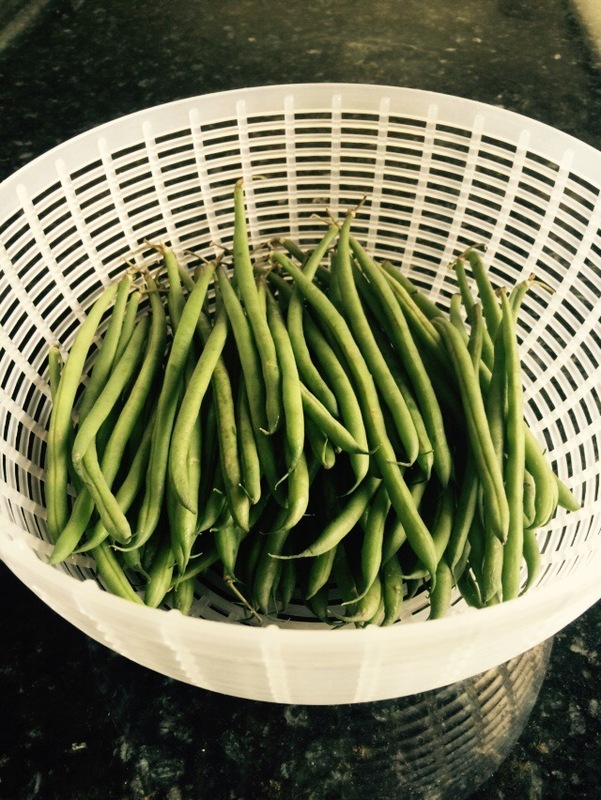 I fondly recall sitting down next to Grandma and snapping green beans, freshly picked from her garden outside. To this day, the act of snapping fresh green beans is very comforting (and even somewhat meditative) to me…it feeds the roots of my soul. In this particular recipe I leave the green beans whole but I love to snap them whenever I have a little extra time on my hands. This recipe is humble (like my roots), yet very special and truly delicious! I encourage you to give it a try. You will be surprised at how flavorful it is. vegetable cutting board (it is wise to dedicate cutting boards to vegetables and others to meats to avoid cross contamination). 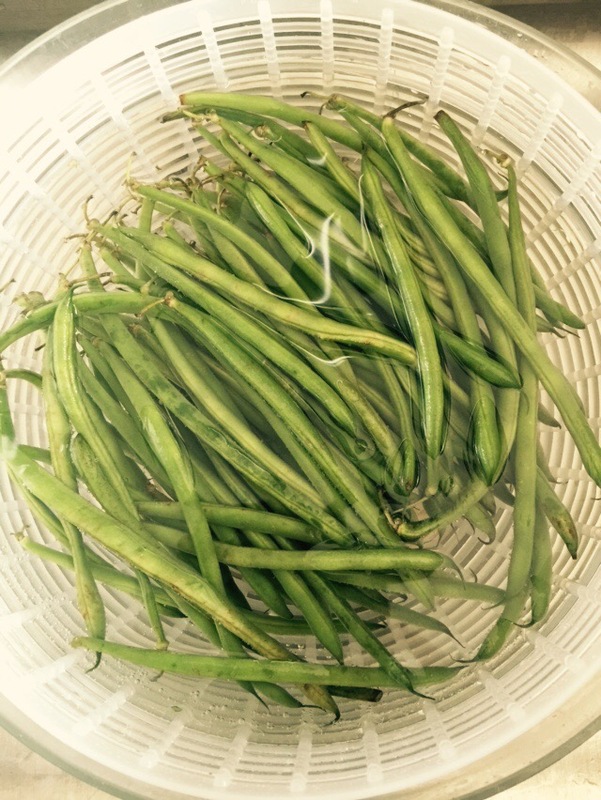 Place the green beans into a colander or salad spinner to wash them. Tip: I place the green beans and strainer into my salad spinner (because it works as a bowl for soaking and has a built in strainer for rinsing). I then add water plus about half a cup of white vinegar. I allow the beans to soak for at least ten minutes and then swish them around and rinse thoroughly to clean them (remember that they grew outside in the dirt with possible pesticides). I try to clean all vegetables in this manner. 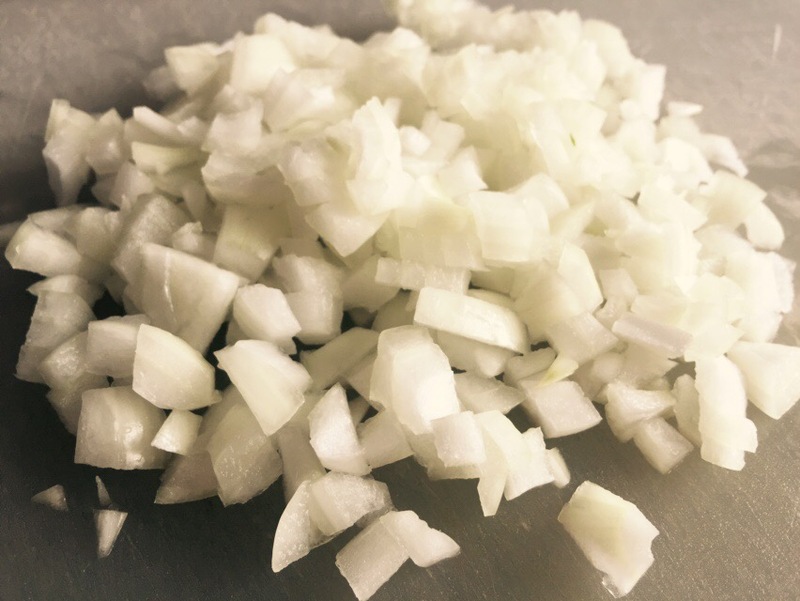 While the green beans are soaking, chop the onion in about half inch chunks (not too big and not too small), using a vegetable cutting board. 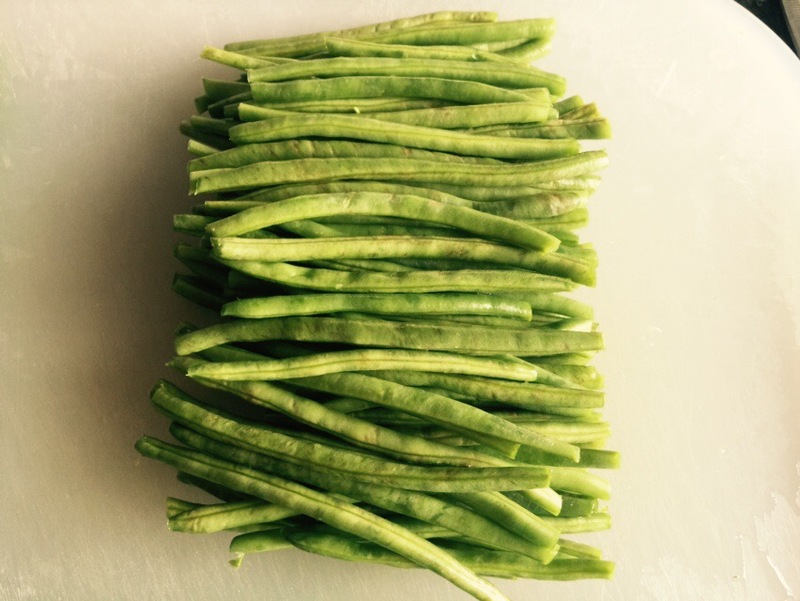 Drain and thoroughly rinse the green beans and line them up on a vegetable cutting board so the stems are all on the same side. 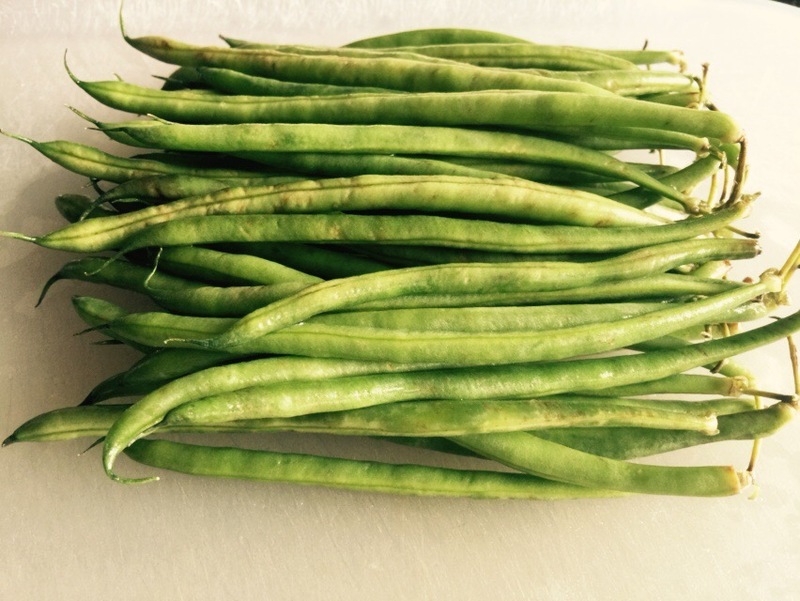 This is especially easy with haricot verts since they are mostly straight and uniform in size. If your green beans are curly and unruly, see the note below. Using a knife chop off all the stems at one time by cutting across the bunch. Repeat on the other side. 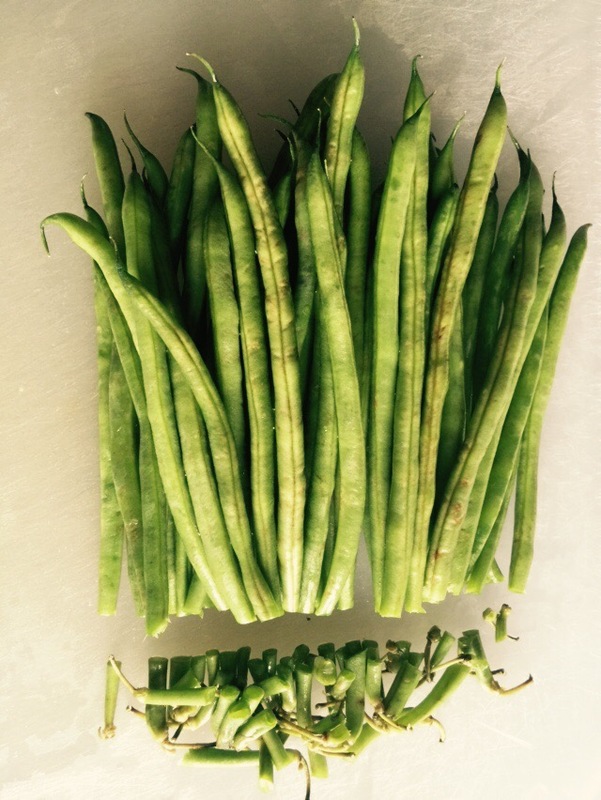 Note: If your green beans don’t line up well, you may prefer to snap them or cut them individually. Cut the tips off the other end of the green beans. Now you have a bunch of clean, uniform size, beautiful beans. Place 1/4 cup regular olive oil in a large deep skillet over medium-high heat. 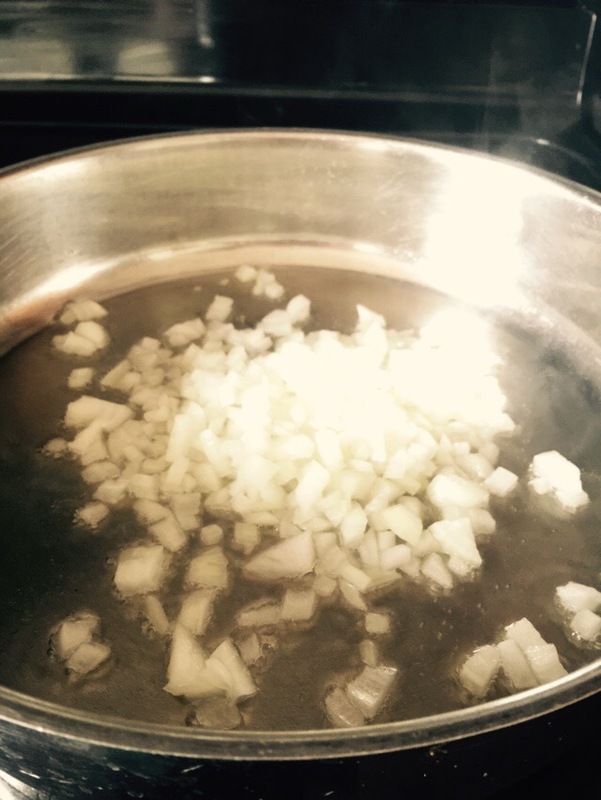 Once the oil is hot (but not smoking), add the chopped onion and sauté till translucent (about 5 minutes). 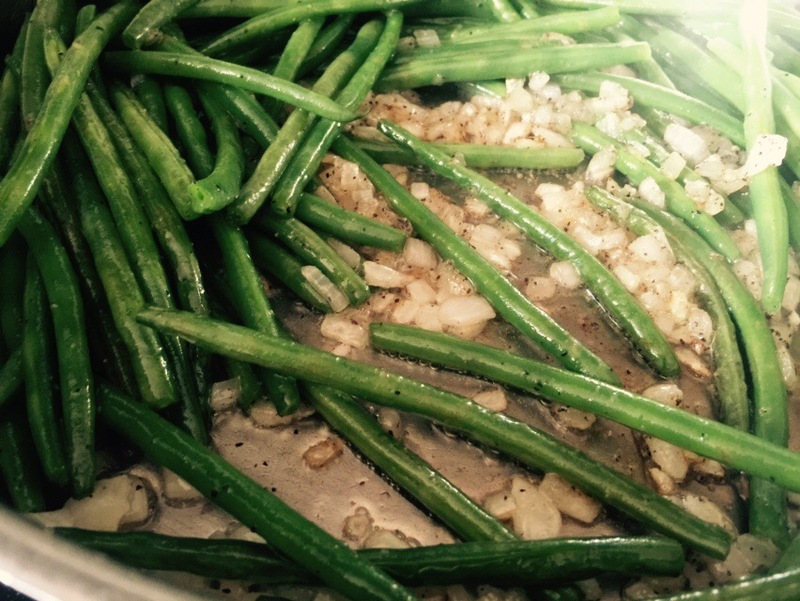 Add the clean, trimmed green beans to the sautéed onions. Add 1 teaspoon salt and 1/2 teaspoon pepper and stir. Continue to cook on medium high heat for about 10 minutes until the onions and green beans are slightly brown (be careful not to burn the onions as they will become bitter if they get too dark). Add 1/2 cup of water, cover with a tight fitting lid and reduce heat to low. Continue to cook until the water has evaporated (about 10 minutes). Test for tenderness. If needed, add a little more water and cover with the lid again and continue to cook for a few more minutes to increase the level of tenderness to your taste. Once tender, check for desired levels of salt and adjust to your taste. Once the green beans are tender, add 1/4 cup lemon juice, stir and cook a few more minutes (the lemon juice is the heart of this dish). 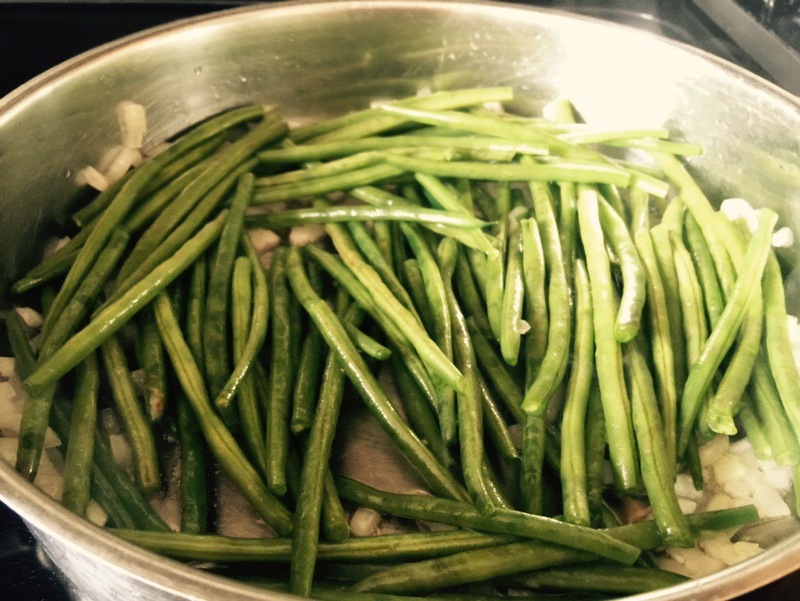 Place the cooked green beans into a serving dish and drizzle with good quality extra virgin olive oil. Taste a bean for desired levels of oil and lemon. If they are not tart enough, add a little more lemon juice. If they are too tart, add a little more olive oil. 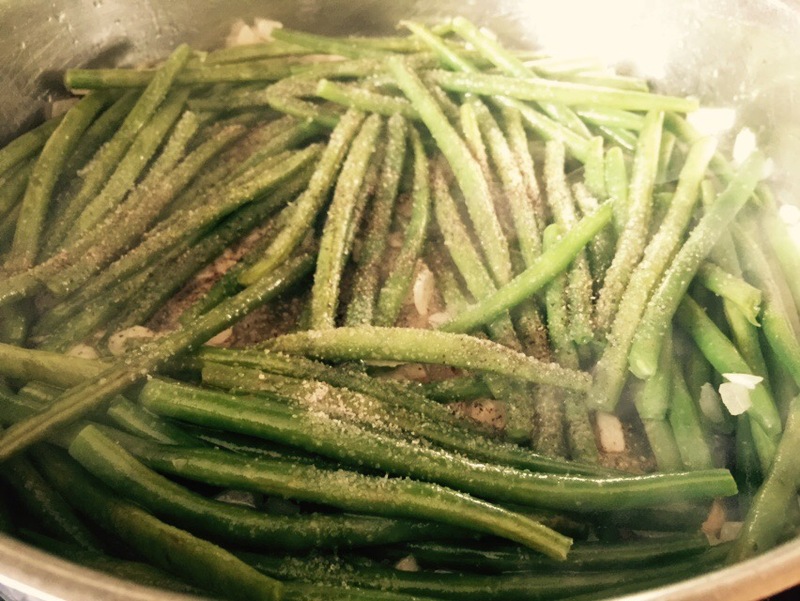 Serve the green beans as a side dish with your favorite meal (or all on its own with a little pita bread). It’s been mighty fine sharing this with you. Ya’ll come back now, ya hear?!?! Thanks for the tips about the separate cutting boards and washing veggies in white vinegar. I did not know that.